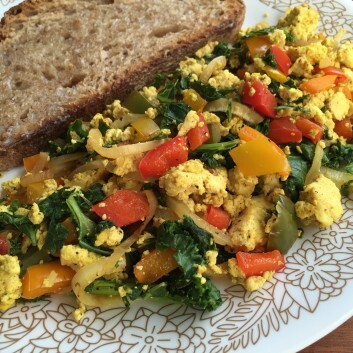 Scrambled eggs have met their match with this vegan protein-packed recipe. I sauté extra-firm tofu with a variety of colorful veggies to create a flavorful morning meal that’s fit for a (vegetarian) king. Thoroughly drain tofu. Wrap the block in paper towel and sandwich between two plates. Place something heavy like a book or pan on top to help press additional liquid out of the tofu. For best results, let it drain for 30 minutes. Replace paper towel, and drain another 30 minutes. Warm a large non-stick skillet over medium heat. Add olive oil, onion and garlic. Sauté, stirring frequently, for about 5 minutes. Add peppers and cook an additional 3 minutes. Remove tofu from paper towel and use your hands or a fork to crumble into bite-sized pieces. Add to the pan with onions and peppers. Add cumin, paprika, turmeric and optional cayenne or chili powder, if using. Cook for 5 minutes, then add kale, salt and pepper. Allow to cook an additional 5 minutes, stirring occasionally.